Establishing permanent links with strategic partners in the supply chain (intermodal operators, freight forwarders). Despite the continuous economic uncertainty, rail’s situation is getting better in some areas, clocking up market shares of 40% and more (that is the case in China, India, Australia, South Africa and the United States). In USA and Russia the all amount of transported goods is above pre-crisis levels. Further growth in rail freight will however depend on the ability of companies to continue to invest in infrastructure and to increase their efficiency and to provide optimum responses to their customers’ requirements: through the quality, simplicity and transparency of their services, pricing (in particular in international traffic), information systems harnessing the potential of electronic commerce and development of partnerships between operators and customers for special transport operations. 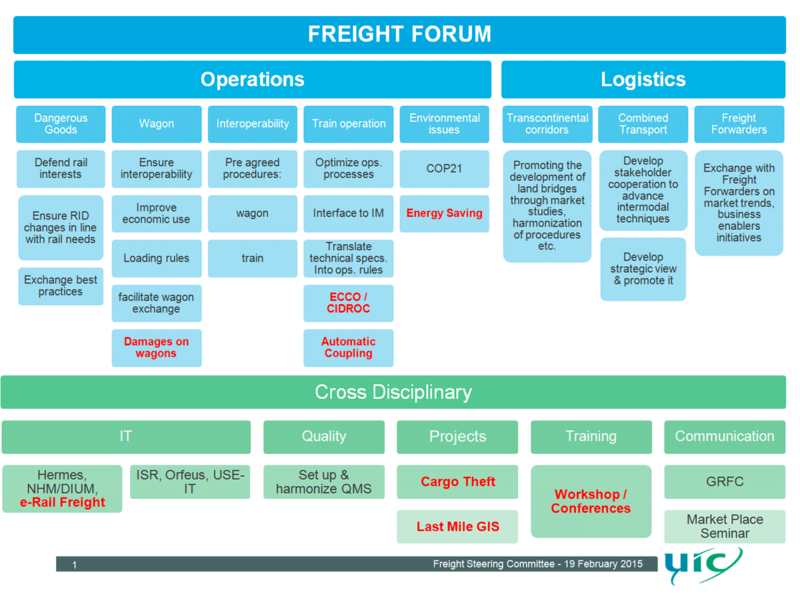 Freight Forum and its study groups (Operation, Quality, IT, Wagon Users, Combined Traffic) working on many permanent issues and projects. The Global Team of Experts has been reorganised to develop intercontinental corridors and increase rail traffic between continents. Market-oriented issues are discussed between the railways and freight forwarders in the UIC-FIATA Permanent Contact Group. from eNews Nr 637 Market Place Seminar 2019: Save the Date!